There are now 12 bouts, including Erick Silva vs. Luis Ramos, set for UFC 134 card. Promotion’s officials confirmed that the UFC 134 lineup has just been finalized with a welterweight bout between newcomers, Erick Silva and Luis Ramos. 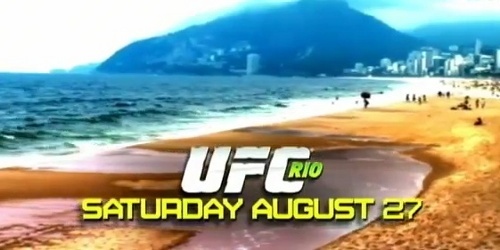 The upcoming event, which will feature 12 match-ups, takes place at the HSBC Arena in Rio de Janeiro, Brazil on August 27, 2011. The night’s main card airs on pay-per-view, two prelim-card bouts are set to air on Spike TV’s “UFC Prelims” special, and Ramos vs. Silva bout – which is also a part of the preliminary card – will go live on Facebook for free. Fighting out from the Nova Uniao association, Luis Ramos (19-6 MMA, 0-0 UFC) will be making his UFC debut after attaining a three-fight win streak during the Watch Out Combat Show seasons. Prior to his victories, “Beicao” participated in a welterweight tourney held by United Glory, wherein he got a unanimous decision loss to Roan Carneiro. Unlike his teammate Jose Aldo, most of Luis Ramos’ career victories come via decision. Another UFC newbie aiming for a slot on the win column is Erick Silva (12-1 MMA, 0-0 UFC) — a Brazilian jiu-jitsu and judo black belt holder who is known for having a superb eight-fight win streak. Before signing for the UFC, he fought under “Jungle Fight Championship,” wherein he defeated Francisco Ayon during the tournament’s final and was then crowned as the Jungle Fight Welterweight champion. For the latest on the UFC 134 card, stay tuned to the UFC Rumors section of MMAjunkie.com.